Jersey Boys is based off the musical of the same name, about the Four Seasons (led by Frankie Valli), and is Clint Eastwood's newest. I had a feeling the movie would be good, as I love their music, and Eastwood's movies usually are; I ended up enjoying the film a lot. Frankie (John Lloyd Young) and his boys grow up in New Jersey together, and once they find out he's a good singer, he starts playing small venues. His mob friend Angelo (Christopher Walken) hooks him up with some performances as well. 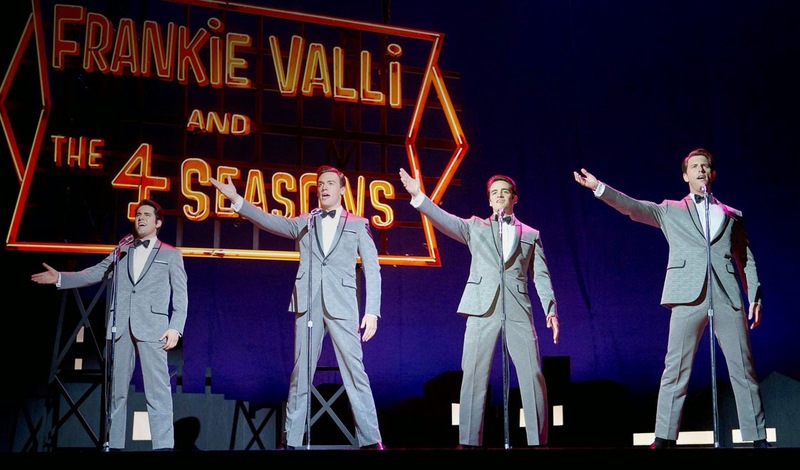 Frankie, Tommy (Vincent Piazza), Bobby (Erich Bergen), and Nick (Michael Lomenda) eventually come together to form the group Four Seasons, with Frankie as lead singer, Tommy as the songwriter/pianist, and Bobby and Nick on guitar. They take off slow at first, but soon have a few hits under their belts; after a while though, the group dynamic tends to shift, and there are problems within the group. Other than Walken, most of these actors are not household names, and I think the movie was actually better off because of that; according to IMDb, most of them have been in a few roles, although Michael Lomenda hasn't really acted before, which was incredible. John Lloyd Young, as well as the rest of the actors, are all fantastic singers, too, and Young does sound like Frankie Valli, who in real life, at age 80, actually still tours (wow! ); it would be interesting to see what he thinks of this film once he sees it. Yes, definitely see this film. It's a movie anyone will like, especially if you like singing, but if you're a Four Seasons fan or at least have heard their songs before, you will like it even more. The movie spans 30-40 years, ending in 1990 when the group gets inducted into the Rock and Roll Hall of Fame, and through those years we learn of their highs and lows, their trials and tribulations, and how they got together and (semi-spoiler) eventually broke up. This should do well at the box office simply because it's Eastwood's baby and also because Walken is in it, but I hope that people go to see it regardless of how well it does or what reviews they read about it. Jersey Boys is in theaters today, June 20th, and is rated R with a runtime of 134 minutes. 4 stars out of 5. I've been hearing a lot about this film, looks like it might be good! I'm not big on period music films like this; I am a huge Elvis fan, but it kind of stops there with him and Johnny Cash. Might be something I could see with my father though. Seeing this Saturday afternoon with my husband, daughter and my parents. Thanks for the review. I love music from this era, so I have been wanting to this film. I think it will be interesting to see the story behind the music. I can't wait to see this. I will probably see it a few times! This sounds really good & like a movie my hubby & I would enjoy together! Thanks for sharing! I am so relieved you liked this. I had SOOOOO wanted it to be good. I've wanted to go see this for a while! I've heard good reviews from everyone who has gone! This is something I'd like to see! There was a feature on it the other night on TV.